malaysia | Value Investing In KLSE>Value Investing Made Easy! Value Investing In KLSE>Value Investing Made Easy! We have to agree that the Malaysian companies have different working culture than our Western counterparts.But if we look at giant successful companies,which most of them are from the developed countries,we should start to look at good culture which should be practised in this era of globalisation. In today’s globalised world,the competition is fierce,hence Malaysian companies must be able to change their ways of doing things.What are the good points which drive companies like Maxis,Digi,Dutch Lady,BAT,Nestle to perform extremely well for the past decade? Is it the people in the company?According Philip A. Fisher,it is essentially the people who will drive growth in a company.What we can notice from the people in these companies are their diverse nationalities.As the people comes from different background and countries,they contribute more creative ideas and processes to overcome problems.If a company consists of all Malaysians only,the people tend to have groupthink-a phenomena where all the people in the companies agree to one another for the sake of avoiding confrontation.We are more conservative due to our culture and background.It’s good to form harmony but in a business settings, people needs to challenge each other positively and to come out with better ideas.In long term,the diversity in the ethnicity and nationality will benefit the company and gives value to the shareholders. Multi national companies (MNC) also have better ‘check and balance’ corporate structure in place. If you analyse their corporate governance by looking at the board of directors,you will notice a diverse background and nationalities of the directors.This is a positive sign because it is harder for ALL directors to act against the interest of shareholders. MNC also has a few major shareholders.Usually the ownerships are divided into 40% to 50% by the founder,30% to 40% by institutions/funds,10% to 30% by retail investors (public).The founder and institutions will watch over the board of directors and management.Independent directors can report straight to the founder without being restricted by the board. Let’s look at an example of a well managed company (DIGI) for better clarity of my explanation. 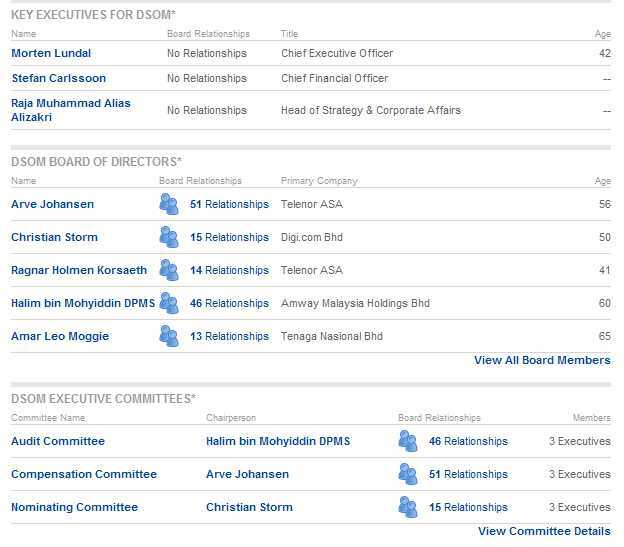 DIGI has 3 major shareholders in early 2007 (Telenor Asia 61% , Goldman Sachs 4.79%,Smallcap World Fund 2.9%).Telenor Asia has been requested by SC to reduce their shareholdings by end of 2007 but this is beyond our scope of discussion today.Let’s look at the figure above showing the people in the board.We have a combination of foreigners and Malaysians in the board.This is a good indication because directors who have broad explosure and global experience can bring in new exciting ideas into the company.When brilliant idea is put into implementation,rapid value growth will occur in DIGI. I’m not encouraging investors to buy DIGI but these are the few qualities which value investors should look at besides price and safety margin.If the P/E of these companies is attractive,I will put vast net worth into these companies.Although the price of these companies will be volatile in short term,the value is intact and will march upward in the future.By then,the financial community will revise their valuation upward. The second criteria is a synergy between the management & political influence. A company with the best management team will fall if the current government policy hinders the core business operation. NEP policy towards certain industries must be given great attention. To stay updated with the economy news, get different views from the local media, which are controlled by the government & oppositions’ sources.Relying on one source is an act of a fool.By analysing different views from both sources,a better investment decision can be made. Numbers don't lie. Click the counter to subscribe via email ! Bear Market Rally Is Ending !!! Bursa Malaysia Is Too Expensive ! This is a bear-market rally ! Jamie Pontius on What is Free Cash Flow?